Monday dawned bright and frosty here in Hampshire but since then the clouds have gathered and we're back to normal - cold and wet! However spirits are high here and in London. Neil and Nigel are celebrating their 20th anniversary of doing Chelsea. They look quite good on it don't they? 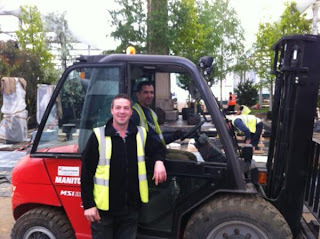 On site the guys are going well: edging moving swiftly into place with the M&M timber team. The organicstone boys are pointing the paving and will have it all finished by the end of the day - its going to look great! 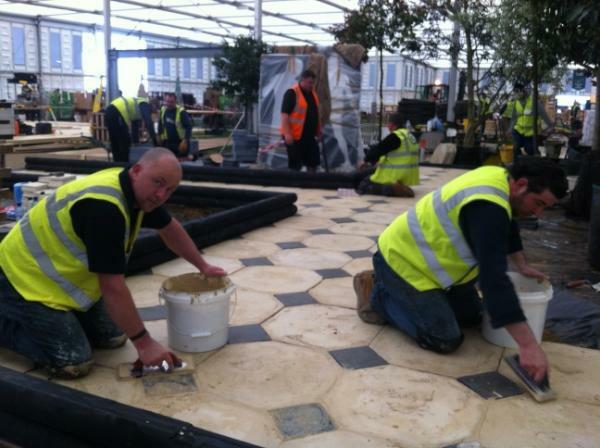 Steve and Luke have laid the two areas of cream paving on the sides of the exhibit and are now on the harlequin paving at the front. All good so far and we're on schedule. We had our staging meeting here for the planting team. 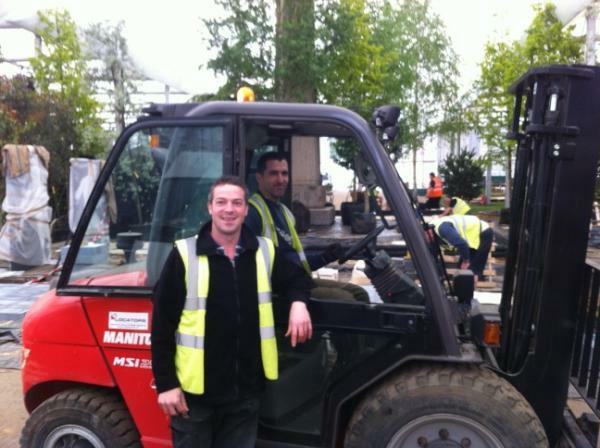 We welcome Luke and Tom from the Sir Harold Hillier Gardens, Paul Hervey Brookes - fresh from Malvern and comng over from show gardens to The Dark Side at Chelsea - Had a tweet from Owen Rogers who may join us staging. After the meeting went for a look round with Ricky - glasshouse - looks good. Only a few reluctant rhododendrons. Roses looking great Englands Rose - wonderful cerise colour, just what I'm looking for to team with silver in front of the fencing piste. There are also some large Syringa x josiflexa 'Bellicent', pretty and fluffy; they will look great alongside the fencer silhouettes. Then a visit to the cold store; almost warmer than outside. This dreary building is a treasure chest just crammed with jewels. 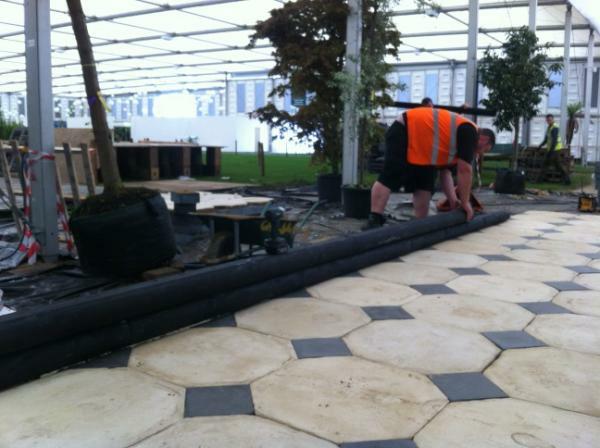 The cherries are going to be stonking - including the parasols. No pictures of these you will have to wait and see! Amelanchiers for the first time ever! Roses, ceanothus, rhododendrons and the Viburnum plicatum 'Mariesii' are just mouthwatering. I'm starting to get inspired............On site tomorrow to welcome the next load of trees. Duel and the Crown - here we come!